I remeber doing this a couple of years ago, I then sent it to Jean-Louis Gassee, CEO of Be.inc as a possible use for BeOS. It seemed my ideas were not too far out given BeOSs fate - being sold to Palm. Funny thing is without a better name I called it a "SuperPalm". I've not thought of a name for it yet but basically it's a combination of several different consumer devices all crunched down into a single hand held device. The only potential problems I see is the battery usuage (it'll eat them!) and there will be a restriction on the minimum size. Put 3 CD cases together and that'll be the approximate size. It might be an idea to have a camcorder style battery underneath as it would allow for more powerful batterys and make it easier to hold. The device would consist of a CD/DVD player. On top of this would be a touch sensitive colour LCD. Covering the screen would be two flaps which fold out to reveal a small keyboard on one and a combination of camera / mic / speakers on the other. The Camera flap would be attached via a universal joint at one corner allowing it to be swivelled around to film in a different direction. Around the edges of the device would be various ports and controls. The front edge would also contain a small ariel - yes, it's mobile phone as well. Along the right edge would be play controls, these would work for CD/DVD/MP3 and anything else the device could playback. Beside these would be headphone socket and volume control although an alternative would be to have a button which activates an on screen volume control. There would be ports for connection to a mouse, keyboard, monitor and TV, USB would probably do for at least some of these. 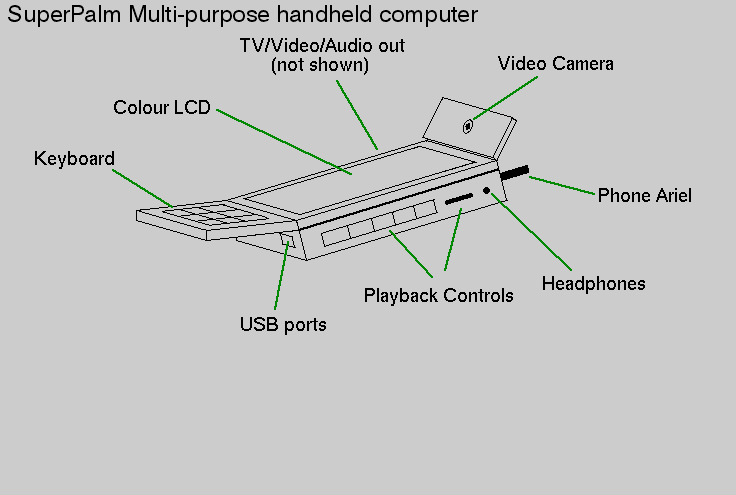 In addition to this PCMCIA port/s would allow additional memory and other devices to be plugged in. This device could be pretty potent but would require equally potent software. The OS would have to be in ROM (up to 128MB) and a large amount of RAM would also be necessary (64 - 128 MB). Flash ROM could probably be used for most if not all of this, that way OS upgrades would be possible and there would be plenty of room for MP3s etc. Standard Plam PC type apps - organiser, word pro etc.. Still and Motion Digital Video Camera. CD / DVD / MP3 playback - also MP3 CDs. TV/Radio (if necessary hardware was fitted). This system of course needs an Operating System and BeOS could do quite a bit of this already. This device is going to require some pretty serious hardware to do all the necessary functions but there are some pretty powerful general purpose CPUs around which are capable of a great deal of it. The biggest problem will be keeping power usage down and physically cramming all the chips into a small area without overheating. Although there are a large number of functions a great deal of these can be done by a sutible general purpose device - Something like an embedded version of Motorolas G4 would probably do - It has low power usage and the Altivec unit would take care of the compute intensive functions such as real time audio / video compression. Something like a Pentium 3 would also work but power consumption would be a gread deal higher. For graphics a full strength 3D chip would be used - many of the more modern chips have DVD decoding hardware which could obviously be used. Something like Nvidea's GeForce256 chip will generate Playstation 2 grade graphics and make the device a potent games machine. Power consumption however may be a bit of a problem from one of these chips, it'd also require it's own RAM. A possible solution to this would be to have a second low power graphics chip which would be used when the DVD/3D wasn't needed. Another hardware device which could be added would be a GPS reciever. While the initial idea was for a portable device a base station could also be useful for when the user is not on the road. It would provide a hard disc, full size keyboard / mouse and some form of network connection to connect it to the users PC. The base station would allow the device to be used as a full PC in it's own right, it would after all be just as powerful. Text and image are both Copyright (c) Nicholas Blachford October 1999.